"If there was such an excess ... the excess supply would automatically be extinguished through the repayment of bank loans, or what comes to the same thing, through the purchase of income yielding financial assets from banks." Well the second part of the quote is easy to agree with... The first part taken alone implies that an "excess" money supply could reduce propensity to borrow, which I've argued against (with one exception) -- but the quote could be missing some context. I'm very glad I stumbled across your blog (via TPC) -- you seem to be thinking along very similar lines to myself, following an epiphany I had a few nights ago. I was thinking about the loans-creating-deposits thing while looking at some charts of the money supply and realized that we're dealing with a *pull-based* system here, all the way through. 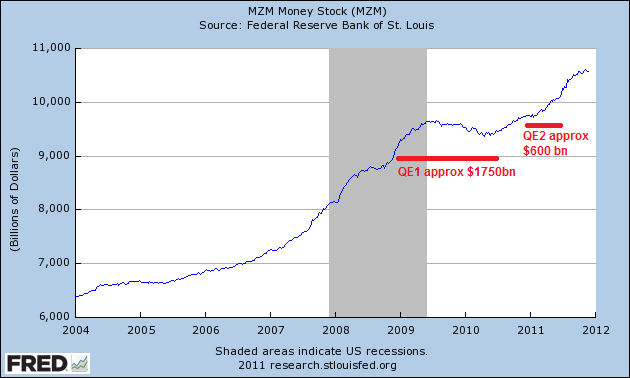 It's not a money supply, it's a money demand! 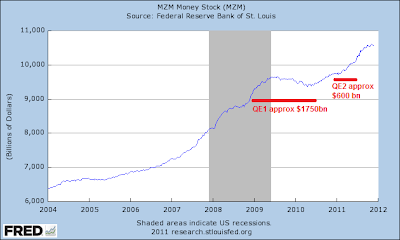 The private sector decides how much money it wants and the money supply grows to accommodate it, almost regardless of monetary policy (aside from the interest rate). One of the key points for me is that it really does matter whom supplies the money: if it's a bank then the non-financial sector takes on more debt; if it's the govt then the private sector acquires savings in the form of govt bonds. That's quite a difference! I would definitely find it helpful if you built this into EconViz! Good, because that's the plan! I've started work on a series of much shorter focused tutorials with interactive exercises... the first is just how loans create money, but I'll get to the broader money supply endogeneity topic at some point. Like your work, and would welcome seeing more on EconViz. Have you looked at sectoral holdings of govt bonds over time? 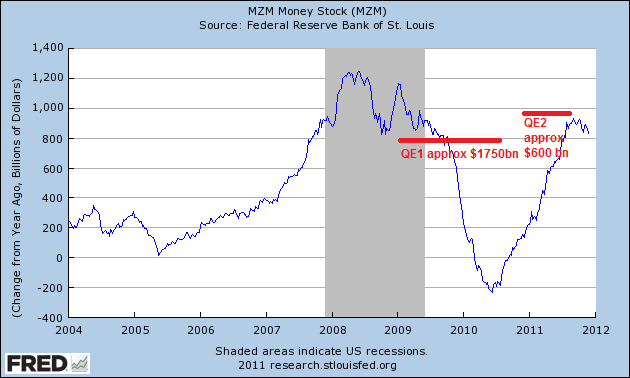 I don't think MZM is very compelling as a time series, not least becuase it excludes time deposits. The actual sectoral holdings of the stuff that the Fed has been buying through QE seems a better thing to look at to test your hypotheses regarding QE and endogeneity. I have to say, i continue to find your and rsj's theses compelling, although looking at UK sectoral data, you really don't see a big shift in bank holdings of bonds, as you would have expected. At one point I did look at the treasury holdings of commercial banks over time, and possibly the other sectors too (I'm not remembering for sure). 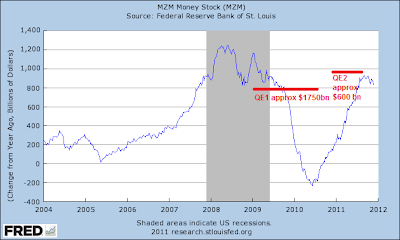 You're right, there wasn't much shift at least for the commercial banks... I'm not clear on who you were saying would have expected or not expected that result :) But that result seems to me consistent with these proposed dynamics.